I’m embarrassed to admit how long it’s been since I’ve been planning to post an article about Matt Bahen. I first became interested in him after last year’s “After Wolves” solo show at Le Gallery. 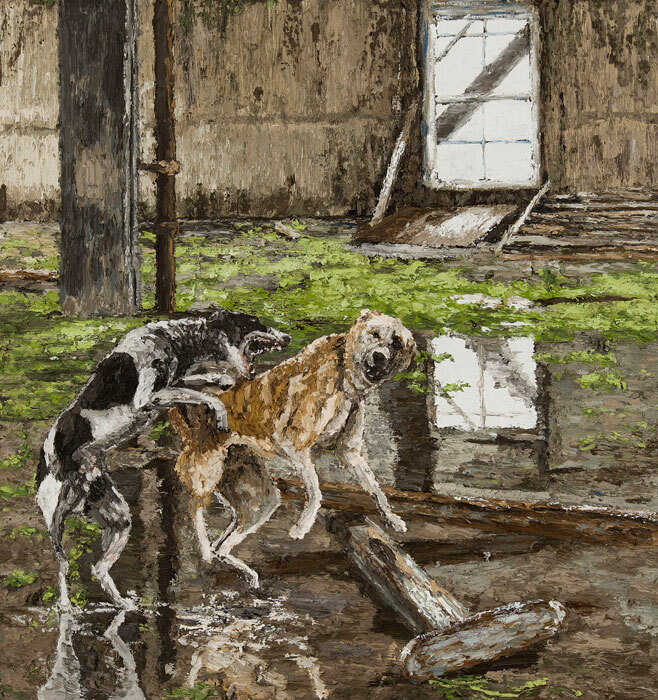 The massive, heavily impasto pieces appealed to my strong love of dystopic fiction, as the scenes alternated between barren Canadian landscapes and demolished interiors- often with dogs standing or fighting within them. 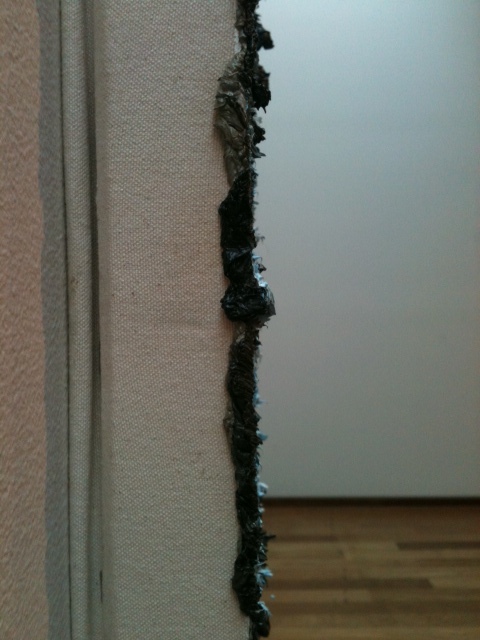 Similar motifs dominated the work in his show at the MacLaren Art Centre in Barrie this summer. 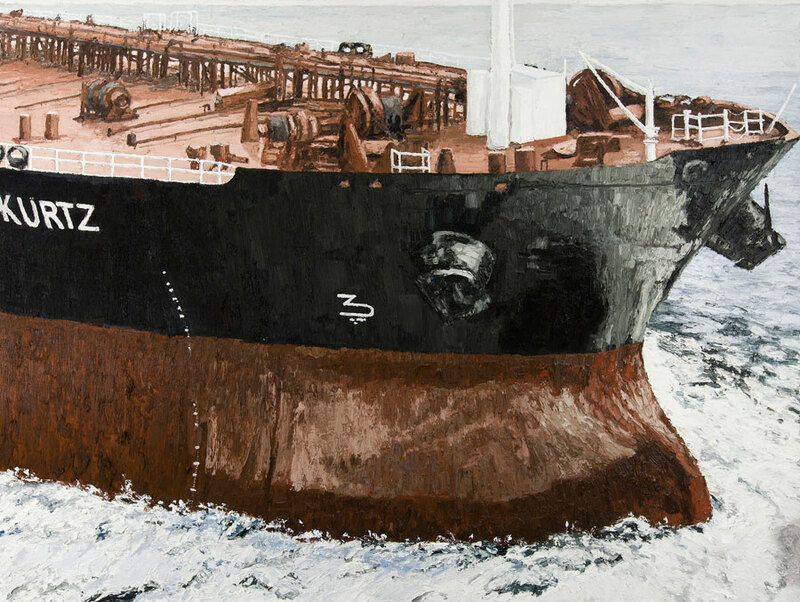 In the show you may have unfortunately just missed “Striking fire out of Rock,” at Le Gallery, Bahen has expanded his thematic repetoire to include empty ships and ubiquitous fleets of starlings. Apparently, according to gallery director Wil Kucey, the dog paintings were so popular that Bahen was at risk of becoming seen more of a crafter of candid canines than the serious conceptualist that I know him to be. My second admission is that I’m writing this as my nearly two-year-old daughter is curled up in her stroller- which is parked in the living room- slumbering amidst dry coughing fits that haven’t quite woken her yet. She tends to want me to lay with her while we nap, though sometimes she falls asleep in her stroller, especially if I prime her with some of the froth from my latte, that said, my time is always limited. (the people at Crafted must think I’m nuts to be feeding a toddler coffee!) 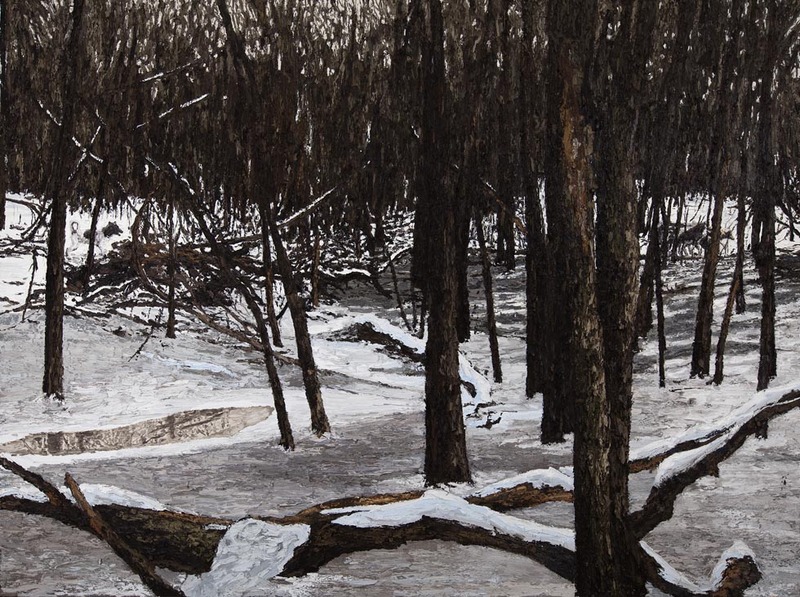 So, with my apologies, most of the following article is taken from the visit I paid to Bahen’s Toronto studio last winter to see him in action, with photos from his shows at Le Gallery and the Maclaren Art Centre. Matt Bahen’s instructions on how to get to his studio swam through my mind as I struggled to maintain my balance while walking down an icy downtown Toronto alleyway. “There’s no number and no street name, but it’s not hard to find.” I was beginning to doubt this advice until I heard opera music blaring from behind a slightly open doorway. “It’s Rossini, the Arias”, Bahen explains to me. “My buddy Steve left it here, I’m gonna get myself sophisticated,” he scoffs wryly, taking an urgent final drag of his cigarette. Bahen appears much more humble than sophisticated. Dressed in plain black jeans, brown leather shoes and a functionally warm fleece sweater this artist’s common appearance belies the contemplative depths yet to be revealed later in our conversation. His studio is also unassuming. His massive oil paintings are stacked against the walls in various states of completion and the floor is littered with containers of unknown article. 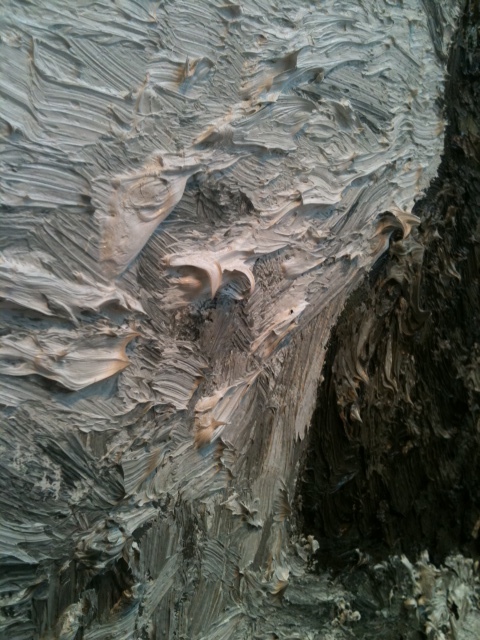 Basketball-sized mounds of excess paint are piled on a board in the centre of the space and in one corner there is a pile of hundreds of empty tubes of oil paint. The overwhelming smell of oil is the only thing warm about the studio. Bahen pulls up a fold out chair for me and places it beside a tiny propane heater on the floor. In front of me is a nearly finished painting of one of his interiors. The scene portrays a once brilliant cathedral, now derelict. 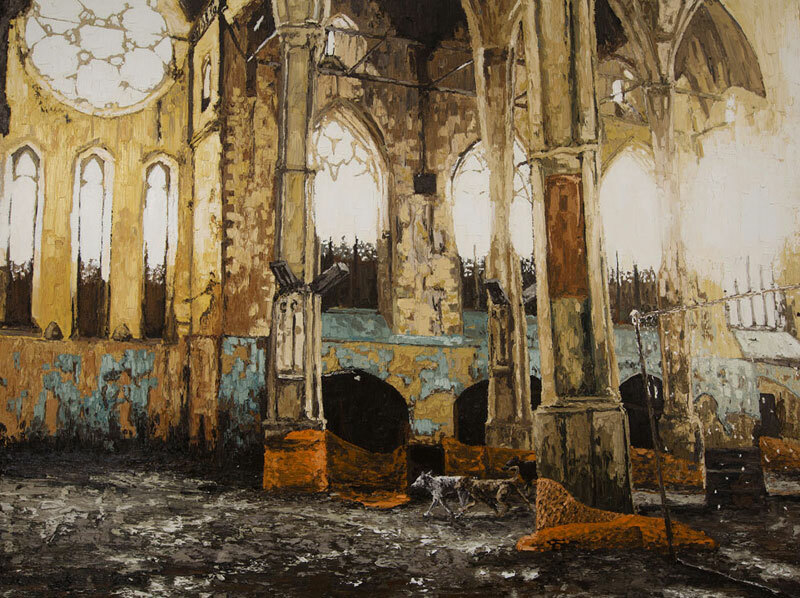 Three stray dogs wander amidst the rubble on the floor of the church. The dystopic implication of these dogs was what initially drew me to Bahen’s work. Never overt characters in the pieces, their presence within the broken interiors is immediately suggestive of a society no longer in control. Bahen points out that his interiors are full of light and life, and notes that the dogs represent a Virgil type character- to be trusted and feared simultaneously. And this man is no stranger to bleak. Having worked as an outreach street worker in downtown Toronto for the last nine years it’s easy to imagine why Bahen needs to have a beer in hand while creating what essentially seem to be visceral studies in suffering. He explains that his initial subjects for painting were war based- jets, snipers, armies, but after working so closely with Toronto’s least privileged, he eventually withdrew from the obvious subject matter of war in favour of more abstract emotional renditions. 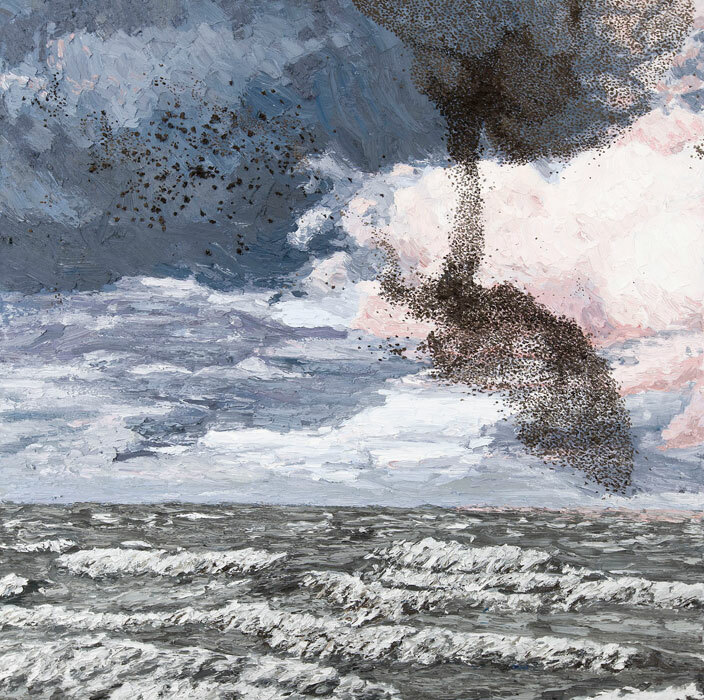 Currently, Matt Bahen is preparing for his second solo exhibition at Munch Gallery in New York at the end of April. There are a bunch of fantastic exhibitions happening in Toronto at present. Stay tuned for another nap-time review prior to the new year.